trucks full of coffee grounds. -Mix grounds into soil as an amendment. Make sure to keep them damp. -Spread grounds on the soil surface, then cover them with leaves or bark mulch. 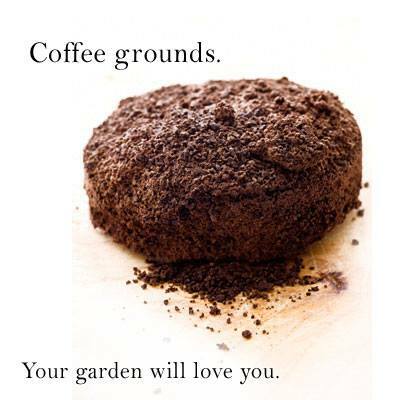 -Add grounds to your compost pile, layering one part leaves to one part fresh grass clippings to one part coffee grounds, by volume.Turn once a week. This will be ready in three to six months. -Or, put them in an existing unturned pile. Just make sure to add a high carbon source, such as leaves to balance it. -Grounds may be stored for future use. They may develop molds but these appear to be consumed during the composting process. Or a large plastic bag works for storage as well. -Paper coffee filters may be composted with the grounds. fertilizer. Coffee grounds have a carbon-to-nitrogen ration of about 20:1, in the same range as animal manure. Germination tests in Eugene showed that uncomposted coffee grounds, added to soil as about one-fourth the volume, showed poor germination and stunted growth in lettuce seed. didn’t sustain the heat as long..
Coffee grounds also can be added directly to soil but the grounds need a few months to break down, Wise said. “We’re not certain about how coffee grounds act with the soil, but anecdotally people say they do dig it into the soil,” she said. An additional benefit of diverting coffee grounds from the landfill is that it helps cut greenhouse gas emissions, said Dan Hurley, waste management engineer for Lane County’s Short Mountain Landfill. “To keep organics out of the landfill is a good thing for reducing greenhouse gas emissions because organics decompose and produce methane. Methane is about 25 times as bad as carbon dioxide, a greenhouse gas,” Hurley said. Recycling coffee shop grounds also fosters interactions between community residents and local businesses. The coffee grounds stay in their communities, meaning that fuel isn’t being used to truck them from far-flung areas of the county to landfills.